Due to the bad weather conditions Amazon suspended delivery to Tamil Nadu, Pondicherry, Andaman and Andhra Pradesh. It is a temporary ban says the Amazon website. Due to inclement weather conditions, deliveries to areas in Tamil Nadu, Pondicherry, Andaman and Andhra Pradesh have been temporarily suspended. 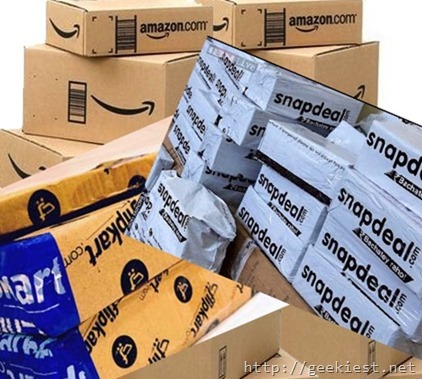 We also found that Flipkart and Snapdeal also stopped delivering to Chennai. Even though there are no official announcement by these shopping websites, we found that they are also not delivering to Chennai. We have tried different pincodes all gave the same result. Hope this will be resolved soon. If you have any updates on this subject please update us. All three apps (Amazon, Flipkart, Snapddeal) have been continuously spamming me with notifications about offers, and also through emails. But none of the websites allow me to place any order. I get they can't service us during this time (despite no rains for a week). Can't they at least use geo location/pin code in the accounts/orders to stop sending me these offers. Thank you Ashwin for the information.